"Yes," you respond, "and my teeth drop..."
A BEST moisture meter will be, right? They all pay for themselves, MANY TIMES OVER if you're a pro and are cheap insurance for the longest life of any wood floor! I won't spend much time on this. Let me just tell you what I have, why, and then you make the call. I settled on the Delmhorst J-4 you see here. Two, in fact. Way back in the 1900's there weren't as many moisture meter choices. - it's so easy to use. - easy to explain and leave with client for material monitoring. - no calibrating and re-calibrating necessary for accuracy. Just a fresh battery, is all. - full 6% to 30% range means you're ready for any conditions. - pins give the EXACT location of moisture, be it on the top of a board, bottom, or end grain, for that matter, which is VERY important for troubleshooting water invasion. ...for those plywood runs to Home Depot. Is the plywood you buy dry? Or did it just come through a driving rain? Or was it just returned from someone's soggy basement project? 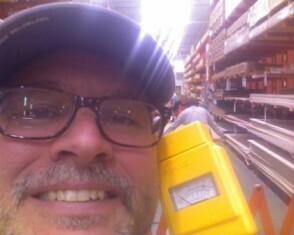 The Delmhorst J-LITE 6% to 30% Pin LED Wood Moisture Meter (See all Hand Tools) has the LED readout, if you prefer. I don't, but it costs a little less and still has the full reading range. I have one of these. Unless you are an inspector, this is the best moisture meter for simply determining DRY. - you need to determine whether or not a slab has a moisture barrier underneath it. - the in floor radiant heat system has cured the gypcrete in which it was laid. - the self-leveling compound you poured has dried. Dry is dry. IF WHATEVER YOU ARE MEASURING IS NOT DRY, THEN THERE'S NO GREEN LIGHT TO PROCEED WITH THE PROJECT. For all other building materials, return to the carousel at the top for even more choices from the oldest and most established names in moisture meters.